Supplies used are all CTMH unless noted: Take a Picture Stamp Set, Topstitch Paper Packet (retired), Heavenly Blue ink, Baby Pink ink, Chocolate ink, Cocoa Ribbon (retired), Basic Brads Assortment, Designer Pewter Brads, Brown Stazon ink, and Petaloo Color Me Crazy Flowers. I thought of this stamp set right away when I pulled out this picture! It was the perfect match and lots of fun to use with many different options. I used it for the title, journaling, corners, and embellishing. 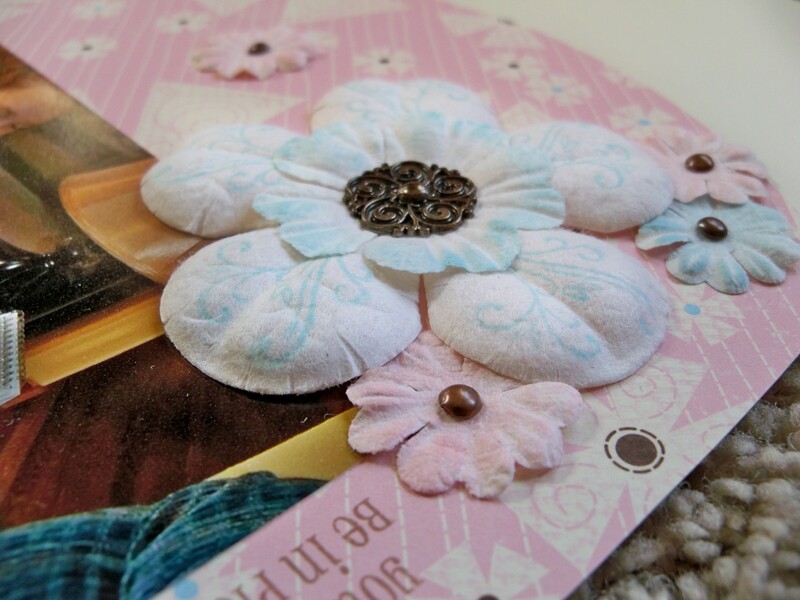 My favorite part of this page is the stamping on the flower. I used the small flourish in the set and it was the perfect touch to the plain flower.